Beware of scams! Local, state and federal officials warn that post-disaster fraud incidents include phony housing inspectors, building contractors, please for disaster donations and fake offers of state or federal aid. Officials never request money for help and always carry ID badges, the release states. Suspicions of scams and fraud can be reported to the FEMA Disaster Fraud Hotline at 866-720-5721, 844-889-4357 or by contacting law enforcement or the Texas Attorney General’s Consumer Protection Hotline at 800-621-0508. There is no fee to apply for or to get help from FEMA, the U.S. Small Business Administration or the state. To apply for assistance visit www.DisasterAssistance.gov or call the registration phone number at 1-800-621-3362. People with hearing loss or with a speech disability can call 1-800-462-7585, and those who use 711 or Video Relay Service can call 1-800-621-3362, the release states. Those with flood damage should contact their local insurance agents or call 1-800-621-3362. Following a disaster declared by the president, FEMA partners with the U.S. Small Business Administration (SBA) to help disaster survivors. The SBA offers low-interest disaster loans to homeowners, renters and businesses of all sizes. To qualify for assistance, or register your sustained damage with FEMA:1-800-621-3362. FEMA app for iPhone includes emergency information by county here. Red Cross disaster assistance: 1-877-500-8645. For information on Texas road closures click here. Click here to list you and your family with the Red Cross as safe. See safety tips from the Texas Department of Public Safety for severe weather here. For assistance filing a personal claim, call the Texas Department of Insurance’s Consumer hotline: 1-800-252-3439. 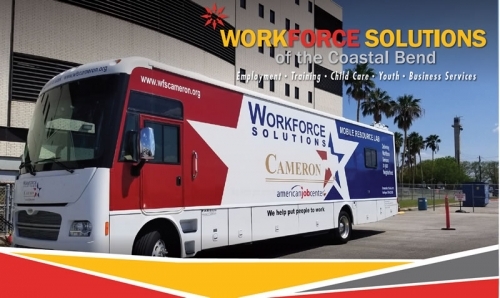 The Workforce Solutions Disaster Unemployment Assistance Mobile Unit is delivering much-needed workforce services throughout the Coastal Bend region. It is in Rockport through the end of this week and will be headed to Refugio and Woodsboro next week. It is a modern “Workforce Center” on wheels equipped with 10 computers, wi-fi, printer and copier to help those affected by the hurricane to file for Disaster Unemployment . Texas PACE Authority is working with Nueces County in Hurricane Harvey Recovery financing.